Production: Greenwich Film Productions (Paris)/Herald Ace/Nippon Herald Films (Tokyo); in color, Dolby Stereo; running time: 160 minutes; length: 14,435 feet. Released 1985. Executive producer: Katsumi Furukawa; producers: Serge Silberman, Masato Hara; screenplay: Akira Kurosawa, Hideo Oguni, Masato Ide; photography: Takao Saito, Masaharu Ueda, Asakazu Nakai; sound recordists: Fumio Yanoguchi, Shotaro Yoshida; sound re-recordist: Claude Villand; production designers: Yoshiro Muraki, Shinobu Muraki; costume designer: Emi Wada; music: Toru Takemitsu; musical director: Hiroyuki Iwaki. Cast: Tatsuya Nakadai ( Hidetora Ichimonji ); Akira Terao ( Taro Takatora Ichimonji ); Jinpachi Nezu ( Jiro Masatora Ichimonji ); Daisuke Ryu ( Saburo Naotora Ichimonji ); Mieko Harada ( Lady Kaede ); Yoshiko Miyazaki ( Lady Sue ); Kazuo Kato ( Kageyu Ikoma ); Shinnosuke Ikehata ( Kyoami ); Hitoshi Ueki ( Nobuhiro Fujimaki ); Jun Tazaki ( Seiji Ayabe ); Norio Matsui ( Shumenosuke Ogura ); Hisashi Igawa ( Shuri Kurogane ); Kenji Kodama ( Samon Shirane ); Toshiya Ito ( Mondo Naganuma ); Takeshi Kato ( Koyata Hatakeyama ); Takeshi Nomura ( Tsurumaru ); Masayuki Yui ( Tango Hirayama ); Heihachiro Suzuki ( Fujimaki's General ); Haruko Togo ( Kaede's Old Lady ). Awards: Oscar for Best Costume Design, 1985. BAFTA Award for Best Foreign Language Film, 1986. Kurosawa, Akira, Hideo Oguni, and Masato Ide, Ran , Boston, 1986. Raisom, Bertrand, with Serge Toubiana, Le Livre de Ran , Paris, 1985. Davies, Anthony, Filming Shakespeare's Plays , New York,1988. Chang, Kevin K.W., editor, Kurosawa: Perceptions on Life: An Anthology of Essays , Honolulu, 1991. Prince, Stephen, The Warrior's Camera: The Cinema of Akira Kurosawa , Princeton, New Jersey, 1991; revised and expanded edition, 1999. Goodwin, James, Akira Kurosawa and Intertextual Cinema , Baltimore, 1994. Goodwin, James, editor, Perspectives on Akira Kurosawa , New York, 1994. Richie, Donald, The Films of Akira Kurosawa , with Joan Mellen, Berkeley, 1996. Yoshimoto, Mitsuhiro, Kurosawa: Film Studies and Japanese Cinema , Durham, North Carolina, 2000. Bock, Audie, in American Film (Washington, D.C.), December 1984. Variety (New York), 5 June 1985.
" Ran Issue" of Revue du Cinéma (Paris), September 1985. Kehr, Dave, "Samurai Lear," in American Film (Washington, D.C.), September 1985. Grilli, Peter, "Production Diary," in Film Comment (New York), September-October 1985.
" Ran Issue" of Positif (Paris), October 1985. Larsen, J. Kornum, "Interview med Akira Kurosawa," in Kosmorama (Copenhagen), October 1985. Nave, B., in Jeune Cinéma (Paris), November-December 1985. Silberman, Rob, in Cineaste (New York), vol. 14, no. 4, 1986. Roth-Lindberg, O., in Chaplin (Stockholm), vol. 28, no. 1, 1986. Ross, T. J., in Post Script (Jacksonville, Florida), Winter 1986. Simons, J., in Skrien (Amsterdam), February-March 1986. Sigal, Clancy, in Listener (London), 13 March 1986. Shakespeare on Film Newsletter , April 1986, December 1987, and December 1988. Fisher, B., in American Cinematographer (Los Angeles), April and July 1986. Rayns, Tony, in Monthly Film Bulletin (London), April 1986. Milne, Tom, in Sight and Sound (London), Spring 1986. Roddick, Nick, in Cinema Papers (Melbourne), September 1986. Thompson, A., "Kurosawa's Ran : Reception and Interpretation," in East-West Film Journal (Honolulu), vol. 3, no. 2, 1989. Forgach, A., "A kaosz gyemanttengelye," in Filmvilag (Budapest), no. 7, 1990. Bannon, C. J., "Man and Nature in Ran and King Lear ," in New Orleans Review , no. 4, 1991. Avant Scène du Cinéma (Paris), June-July 1991. Geist, K., "Late Kurosawa: Kagemusha and Ran ," in Post Script (Commerce, Texas), no. 1, 1992. Revesz, A., "Bolondok roppant szinpadan," in Filmkultura (Budapest), no. 5, 1992. Vidal Estevez, M., "William Akira Shakespeare Kurosawa," in Nosferatu (San Sebastian), no. 8, February 1992. Crowl, S., "The Bow is Bent and Drawn: Kurosawa's Ran and the Shakespearean Arrow of Desire," in Literature/Film Quarterly (Salisbury, Maryland), vol. 22, no. 2, April 1994. Manheim, M., "The Function of Battle Imagery in Kurosawa's Histories and the Henry V films," in Literature/Film Quarterly (Salisbury, Maryland), vol. 22, no. 2, April 1994. Howlett, Kathy, "Are You Trying to Make Me Commit Suicide? : Gender Identity, and Spacial Arrangement in Kurosawa's Ran ," in Literature/Film Quarterly (Salisbury, Maryland), vol. 24, no. 4, October 1996. Kane, Julie, "From the Baroque to Wabi: Translating Animal Imagery from Shakespeare's King Lear to Kurosawa's Ran ," in Literature/Film Quarterly (Salisbury, Maryland), vol. 25, no. 2, April 1997. 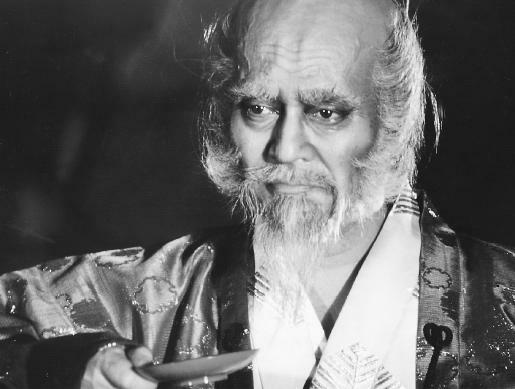 Akira Kurosawa's Ran is not so much an homage to Shakespeare's King Lear as it is a re-examination and deepening of its main themes and ideas. Shakespeare's story is built on all the elemental themes which have characteristically interested Kurosawa: greed, betrayal, and disloyalty to codes of personal honor. In Kurosawa's hands these themes become contemporary and expansive despite the fact that the film is set in feudal Japan. Ultimately, Kurosawa achieves this universality because Ran is an almost complete marriage of content and style. Kurosawa turns to many of the stylistic techniques that have come to be associated with his career. Sweeping panoramas, rich and powerful shot composition, and dramatic depth within the frame accomplished by combinations of back and foreground action and layers of synchronously recorded sound are the building blocks out of which Ran grows. For example, Kurosawa creates conflict and dynamism within the frame with contrapuntal movement. When troops are laying siege to the aging warlord's castle, regiments of samurai pass in front of the camera, some running horizontally, others directly away from or directly toward the camera. There is a sense of chaos that is heightened by the red and yellow banners each soldier wears according to his allegiance. Visually the battle is a melee of red and yellow banners blowing freely, falling out of sight as troops fall, and finally the yellow are simply engulfed by the red. Shot composition has also been one of the earmarks of Kurosawa's career. While many modern filmmakers have gone to the moving camera as a staple of their visual style, Kurosawa has remained loyal to the still frame and stationary camera. Ran is little different in this regard, since essentially it is constructed from a series of still frames, each one a painting come to life. During the battle at the warlord's castle, for example, the shots of troops rushing to do battle are juxtaposed with still shots of bodies heaped on top of each other and battlements burning in silent agony. Each of these shots is composed with an eye to detail and maximizing its power while it is on the screen. The true technical virtuosity of Ran , though, lies in the post-production stage. The power inherent in the visuals is given depth and dimension when the externals—elements such as sound effects and music—are added. As the captain of the warlord's army dies, for example, he calls out to his master, "We are truly in hell." As he does, the sounds of battle are replaced by a tranquil, orchestral theme which plays point-counterpoint with the ongoing images of death and destruction. It is as if we are truly standing back watching hell rise up until that moment when we are brought back to the film's present by screams from within it. It has been said that Akira Kurosawa's work in the work of images, and is therefore concerned not with things but with ideas and metaphors. This being the case, in Ran the still frame is the world that has grown stagnant and is being destroyed from within by the visual turmoil. The film ends with a shot of the warlord's greedy, traitorous daughter-in-law standing on a mountain peak watching the return of troops that have slaughtered her allies. At the moment when the camera holds her in long shot, eclipsing a blood-red sunset, we too are standing on the precipice, a footfall away from falling into the abyss. Slight correction. The person on the precipice is the blinded victim of the Great Lord and the brother of Lady Sue. The daughter-in-law and wife to two of the brothers is beheaded about four minutes earlier after getting "satifaction". I've owned this film for years and never got round to it 'til just now. To anyone new to this, it is as good as they say.